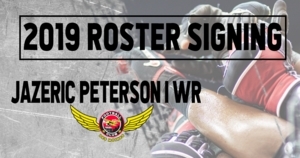 DES MOINES – The Iowa Barnstormers have signed wide receiver Jazeric Peterson to the 2019 roster, Head Coach Dixie Wooten announced today. Peterson (6-1, 190, Faulkner University) joins the Iowa Barnstormers for his rookie season in the Indoor Football League (IFL). Collegiately, Peterson began his career at Alabama State University before transferring to Faulkner University where he spent four seasons with the Eagles.